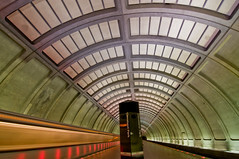 A man was hit and injured by a Red Line train at the Van Ness-UDC Metro station this afternoon after he put himself on the tracks intentionally, according to WMATA. DC Fire & EMS retrieved the man from under the first car of the train and transported him to an area hospital. Until the incident scene is formally documented, the Red Line will be single-tracking from Cleveland Park to Friendship Heights, resulting in (yet more) delays. Is this Metro’s worst year? It’s look like it. Update: Metro says that “normal” (degraded) service has returned after the accident. This entry was posted in: The Daily Feed, WMATA, WTF? !